The Dead Sea is one of the world’s most amazing places. A salt lake whose banks are more than 1,310 feet below sea level, it is the lowest point on dry land. 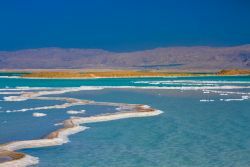 The Dead Sea is flanked by mountains to the east and the rolling hills of Jerusalem to the west, giving it an almost other-worldly beauty. Its famously hypersaline water makes floating easy, and its mineral-rich black mud is used for therapeutic and cosmetic treatments at area resorts. The warm, soothing, super salty water, about ten times saltier than sea water, is rich in chloride salts of magnesium, sodium, potassium, bromine and several others. The unusually warm, incredibly buoyant and mineral-rich waters have attracted visitors since ancient times, including King Herod the Great and the beautiful Egyptian Queen, Cleopatra. 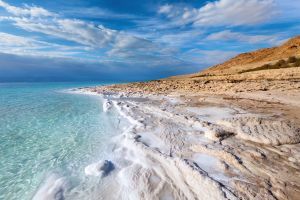 All of them have luxuriated in the Dead Sea's rich, black, stimulating mud and floated effortlessly on their backs while soaking up the water's healthy minerals along with the gently diffused rays of the sun. Dead Sea’s location, so low below the sea level, makes it possible for a number of Dead Sea wonders. This vast stretch of water receives a number of incoming rivers, including the River Jordan which dead-ends here. 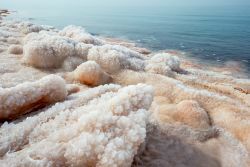 Once the waters reach the Dead Sea, they are land-locked and have nowhere to go, so they evaporate, leaving behind a dense, rich, cocktail of salts and minerals that supply industry, agriculture and medicine with some of its finest products. This results in the sea’s waters maintaining nearly 34% salinity. The barometric pressure and high oxygen levels on the sea’s shores dilute the sun’s harmful rays more than any other place on earth. That means that you we don’t burn as quickly here. No wonder that the region is legendary as a source of healing, and has become a popular center for health, rehabilitation and beauty treatments. In addition, the surrounding desert offers many oases and historic sites. Although sparsely populated and serenely quiet now, the area is believed to have been home to five Biblical cities: Sodom, Gomorrah, Adman, Zebouin and Zoar (Bela).